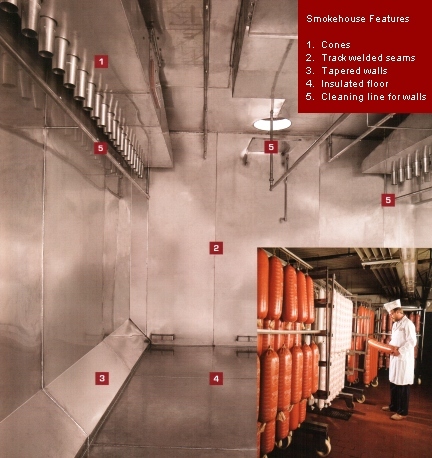 Smokehouses .... for consistent results and optimal product flows ! 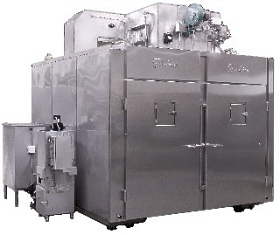 Friedrich focuses on batch processing, and to that end we provide a full range of products for cooking, smoking, drying, fermenting, and steaming, with capacities of up to 16,000 lbs. In addition, we manufacture intensive chillers for rapid cooling. We design and build ovens with features that greatly improve cooking results, times, and yields. To accomplish this, we are meticulous about reducing turbulence and maintaining laminar airflow. Our ovens were the first to employ tapered walls at the floor level. This feature facilitates better circulation at the bottom of the oven. Alternating dampers are aerodynamically designed to provide smooth airflow, resulting in more efficient use of motor horsepower and better air circulation in the cook chamber. In addition, alternating dampers are adjustable and programmable to ensure proper formation of the "breakpoint" in the smokehouse. This accomplishes two goals: even heat penetration of your product and reliable, consistent cooking. For a video demonstration of our unique air flow system, click here. Models available in capacities ranging from 500 to 16,000 lbs. Units can be configured for flow through of products or for single door loading/unloading. All stainless steel construction, including structure. Adjustable alternating dampers and tapered walls. Product Inspection DoorThe microprocessor precisely controls cooking, but we know there are operators who are "hands on" people. 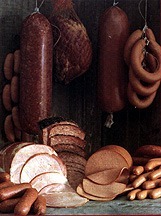 A 12 x 12 inspection door allows operators to check product without opening main smokehouse door. Door lock releaseA safety feature to prevent accidental lock-ins. Friedrich also supplies a full line of smoke generators, blast chillers, drying rooms, steam cabinets, catalytic afterburners, smoke trucks, smoke sticks and other accessories.